Vegas Mania is a five-reel, 21 payline slot machine designed for serious, strategic slots players. They can get up to fifteen free spins and Wild symbols improve the chance of winning. Double Wilds increase chances of winning and double those winnings. Like all games at the innovative new casino, the new Vegas Mania is tied to the WinADay.com progressive jackpot. Just last week, WinADay.com launched a new multi-hand video poker game called Deuces Wild where avid players can play up to fifty hands at a time. For a preview of the new game, see the Slotland News channel on YouTube: http://www.youtube.com/user/SlotlandNews. Two free contests celebrating the new game continue until Thursday. This latest win is the fourth big progressive jackpot win at WinADay.com since it launched just over a year ago. 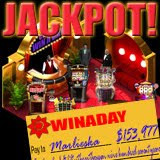 Monica68 won the first big jackpot, ($148,724 (€116,200), on the Wheeler Dealer slot machine last January. In March “123jaki” won $159,660 (€123,620) on the single-payline Slot-O-Matic which had only just been launched at the time and then in May BONDGIRL won $100, 224 (€73,970) – the second big jackpot to be won on that machine. The WinADay.com jackpot has been reset and is currently over $30,000. Meanwhile the jackpot at Slotland.com which was recently hit for just over $80,000 is already over that amount again.